In his book, Bhidé destroys a few icons (or at least makes a convincing case of it) from Schumpeter to modern ‘techno-nationalist’ demands on more research spending. 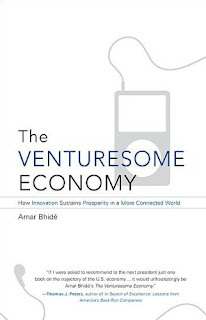 He does it with impeccable credentials as an ex-McKinsey consultant and a Columbia professor and by using strong empirical data from analyzing venture-capital backed enterprises to find out how innovation really happens. He argues that prosperity arises not from creating new technological breakthroughs but from the capacity to use these breakthroughs by companies and customers. An early example is the transistor, whose basic idea was invented by an Austro-Hungarian and a German physicist, further developed by Bell Labs in New Jersey and licensed to Texas Instruments, which manufactured the first transistor radio, but never achieved the breakthrough commercial success. Another company to obtain license for Bell Labs’ patent was the then tiny Japanese company Sony, which started mass producing transistor radios. The rest you know. The story repeats itself with the iPod. Creative Technology of Singapore was selling a similar product two years before Apple, but the fame and profit belongs to Apple. (Apple paid to Creative Technologies USD 100 million in a later court case.) The actual iPod was a rather international effort: the English company ARM has developed the CPU or the brain of the system, Frauenhofer Institute of Germany licensed MP3 technology, the hard-drives first came from Toshiba, the audio codecs by Wolfson Electronics in Edinburgh, etc. Where Apple excelled was creating the design, the marketing, the hype, the dedicated customers (who serve as free testers for the first generation products), the complex legal structure for iStore, etc. The conclusion is not that Bhidé would argue against public spending on research. Neither does he say that the technical development of Asia poses no threat to the West. Rather he argues that innovation is a multiplayer, multidimensional game, where simply putting more money into research will not create more prosperity for the country. At that time, no one could have foreseen the current state of Europe, still in many ways the observation of Adam Smith still resonates today. Without innovation friendly economic environment, that considers the real nature of innovative processes, I don’t see how we could maintain our European economic and social model. This is the real competitiveness pact for Europe. We should pay more attention to innovation this Friday and not let it be overshadowed by debates that seem more important on the short term.